The “Happy to be Here Comedy Show” was held in the Bart Luedeke Center on April 12 in tribute to the late Fred Yeager, a World War II veteran and former political science professor. Senior film, TV and radio major Zane Birnie (left) was the only student comedian, performing among professional comedians. 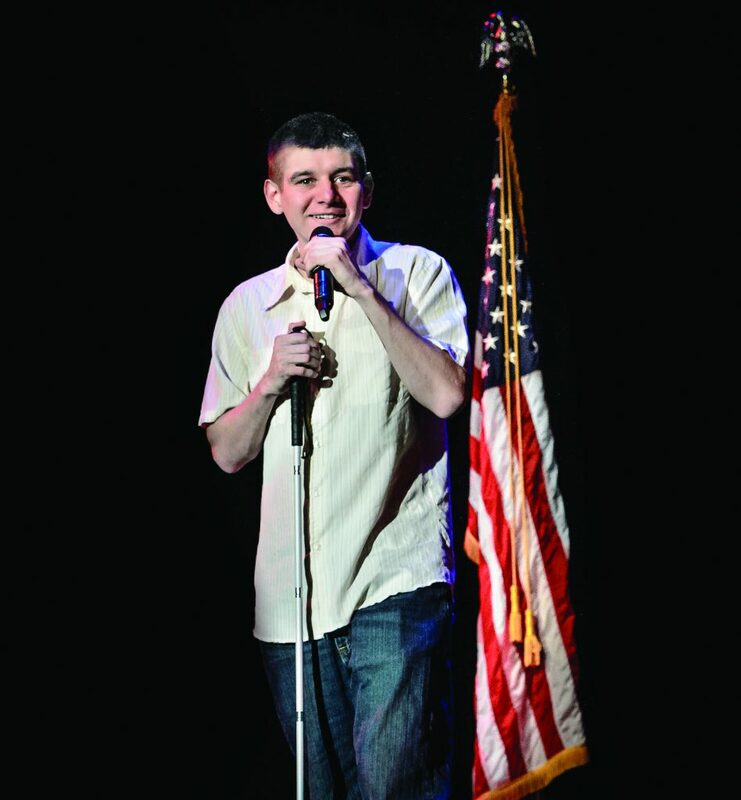 For the past three years, an annual stand-up comedy show has been organized to benefit the Rider Veterans fund. “Happy to be Here Comedy Show,” a title unique to this year’s show, was held on April 12 in the Bart Luedeke Center (BLC) theater. When naming the annual fundraiser, the intention was to honor the late Fred Yeager, a World War II veteran and former political science professor. His granddaughter, Jessie Yeager, affectionately refers to him as “SuperFred” due to his optimism when he faced adversity in the war and afterwards. To emulate the happiness that he brought to others, the Rider Veterans and Military Affairs Office hosted the comedy show in conjunction with the Rider Improv Organizational Troupe (R.I.O.T.) to pay tribute to his hope and resilience. Laughter from the audience seeped throughout the BLC due to the hilarity brought on from the performances. Fred Yeager was raised by a single mother during the Great Depression in New York City with his five siblings, according to his granddaughter’s jewelry line website, I Like. His academically-driven personality led him to receive a scholarship from West Point, where he participated in football, basketball and baseball. After graduating from West Point, Fred Yeager left to serve his country in World War II. While stationed in the Philippines, Fred Yeager took action that would later award him a Silver Star, according to The Hall of Valor Project website. Completely disregarding his own safety, Fred Yeager went under heavy gunfire in order to save a severely wounded soldier who would otherwise have been left behind. Shortly after his heroic deed, he was taken prisoner by Japanese forces and made to partake in the Bataan Death March, his granddaughter said. According to History.com, the Bataan Death March was a 65-mile walk that captured United States and Philippines soldiers were forced to endure in order to get to the Japanese Prisoner of War campus. Thousands of men were killed, and once at the camp, the remaining experienced inexplicable torture. Surviving the march, Fred Yeager was amongst the prisoners that suffered harsh treatment, starvation and physical and psychological abuse. However, his granddaughter said that her grandfather was determined to stay positive. Thomas Reddington, coordinator of veteran affairs, said that Fred Yeager’s club spread throughout every prison camp under Japanese control due to the frequent transfer of prisoners between the various POW camps. After three and half years as prisoner, Fred Yeager was released at the end of the war, Reddington said. Jessie Yeager continued that her grandfather was deeply impacted by his interaction with the Russian prisoner that he decided to continue his education and study Russian. Before Fred Yeager left the military, he served as an assistant military attaché in Russia, Jessie Yeager said. Once retired, he settled down and became a professor at Rider, according to Jessie Yeager. Hosting these competitions in the pub, Fred Yeager said in a 1979 Rider News article that he was inspired to create this songfest by wanting to garner the same enthusasim his “I Like It Here” club had during his imprisonment. “Those who admire, cherish, adore or just plain love, the sweet sound of songbird music should plan on being at the Pub Thursday,” Fred Yeager said. Those that shared the same sentiment for Fred Yeager, veterans and laughter showed up to the “Happy to be Here Comedy Show,” where there was not a moment without enjoyment. With a enthusiastic audience, the reception of the show was a collective one of merriment, even to the stage crew and performers. Honoring the memory and impact that Fred Yeager had during the war and on campus, Reddington said that this event is a reflection on how important it is to remember veterans, especially those at Rider. Reflecting on the legacy of Fred Yeager, Douglas was encouraged.